The good news is that DC managed to boost and stabilize its line after a very tough couple of years. The bad news is that DC took its best shot and it bought them a reset to 2010, basically. Now, it should come as no surprise to anyone that there was a big sales spike when the New 52 thing launched. A brand new reset of DC's entire line with no ties to past continuity and a slew of #1 issues meant that every issue of every title provided an easy, natural jumping-on point for any reader. And it should also come as no surprise to anyone that sales dropped pretty quickly afterwards. I know several people who bought every #1 issue to try them all out, fully aware that they would drop any/all titles that didn't strike their fancy within one issue. Maybe two. That's perfectly normal with #1s. But, as Frisch points out, the overall landing point for DC is about where they were in 2010. Now, you could argue that Frisch is using average numbers and not specifics, so one particularly good or one particularly bad issue could skew your impression of the data. But I like the approach here because it points to the larger problem DC has, one that I pointed out when they announced the new Shazam: namely, they're just selling more stuff to the same audience without bringing on anyone new. Think about that. The New 52 thing was HUGE for DC, and they got some solid, positive mainstream media coverage in the likes of the New York Times and Forbes. This was not something like "Avengers vs X-Men" which is kind of big hype within comic circles but largely ignored outside them. This is co-publisher Jim Lee being a guest on NPR! This is co-publisher Dan DiDio chatting with the Washington Post! We are talking about one of the biggest campaigns from a single publisher specifically for a comics line in years. And nobody bothered with it. Well, obviously, not "nobody." Comic fans gravitated towards it. And I expect a portion of those initial #1 sales were folks who did see/hear something in mainstream media. But if the overall numbers DC has now are pretty much the same as a couple years ago, even after all that hype, that suggests that all they did was stir up the pot of current comic fans a bit. Maybe they won some Marvel fans over. 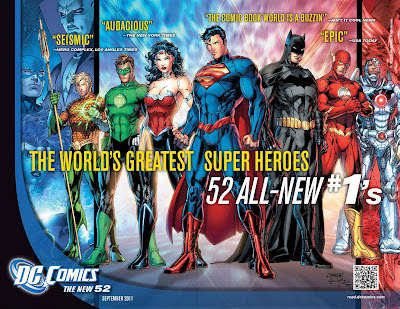 Maybe they got an "I only buy Batman" guy to pick up JLA as well. Maybe they got some current fan's girlfriend to try Wonder Woman. But, by and large, we're talking about people who were already going into comic shops. No one new. DC is taking the same pie and just slicing it a little differently. Now, to be fair, the fact that non-comic fans didn't flock to New 52 likely has other factors involved. There are probably some people who were mildly interested, only to find out that there's no place that sells comics near them. Maybe they would've bought something if there was a place selling them on their way to the bus stop, but they're not THAT interested that they're going to go much out of their way. Or worse, someone heard about it and found a comic shop. Only to find it one of the most skeevy, uncomfortable, intimidating stores they've ever walked into. Then they see Comic Book Guy leering at them from behind the counter and realize that Matt Groening wasn't exaggerating! Yeah, don't expect to see them ever again! So, there's some blame to go over to distribution here, certainly, but I think the larger problem rests with DC. For all the new costumes and new continuity and new origins and new creators and everything else, all DC did was make some cosmetic changes. Their basic stories, their underlying themes are no different than they were a year ago. They're still basically all the same heroes doing all the same stuff for the same audience. And while that's great for current comics fans, that's lipstick on a pig for everyone else. I'll leave you with this recent Little League comic from Yale Stewart. Couldn't agree more on your points. The only comic from 52 I do enjoy, Batman, didn't change at all. They're telling a self-contained story and that's it. It could've been done within or without a reboot. That's my rant for today. I bought the first several issues of "All-Star Western" because I heard such great things about it, plus I occasionally picked up an issue of the previous Jonah Hex series and thought many of them were excellent. ASW #1 seemed very promising. From there, the series steadily went downhill, with the initial story stretched out far too long with filler that got to the point where Jonah Hex was fighting a giant bat in a cave beneath Gotham City. Riiiight. Arguably the earlier iteration of the series, with its mostly one-and-done stories, made it too easy for readers (like me) to drop in and out. On the other hand the new series convinced me to simply drop out, period. I can't speak for any potential genuinely new readers drawn in by the event, but it certainly didn't seem like a good attempt to achieve any lasting gains with an occasional/lapsed reader. But now Green Lantern is gay! This is nothing like the old DC universe, where Green Lantern's SON was gay. It's completely different and so much more relevant, don't you see?